Here are some pictures of our safe and welcoming studio. We look forward to welcoming you to Expressive Glass, the premier glassworking studio in Buffalo, NY. 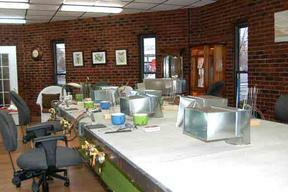 Our work surface was custom designed and fabricated to be spacious and safe. It is it is covered with fire resistant cement board and is a height that permits you to stand or sit. There is a Minor Burner at each station with its own quick releases, regulators, and ventilation hood. Our cushioned drafting chairs can be adjusted for your comfort. 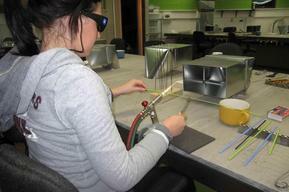 Students and renters have use of our kilns, mandrels, tools, and goggles. A selection of Effetre, Vetrofond, and CIM glass is available for purchase. Our 2000 cfm fan (seen here prior to its installation) is mounted on the building's exterior minimizing noise in the studio while providing needed ventilation. We have our propane tanks housed in a locked cage and safely stored behind cement barriers. 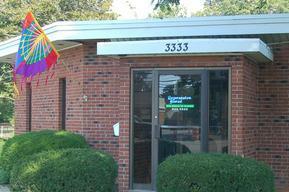 Our brick one-floor building is easily accessible from our private 10-space, complimentary and well-lit parking lot. Our neighborhood is located near a gas station, deli/quick mart, church, several restaurants, and Oma's Guest Haus. We have 9 equipped stations laid out around a 24' table. Each person is provided with a spacious work area (minimum of 4') and an environment conducive to working alone or sharing ideas and energy with other lampworkers.